System theory is becoming increasingly important to medical applications. Yet, biomedical and digital signal processing researchers rarely have expertise in practical medical applications, and medical instrumentation designers usually are unfamiliar with system theory. System Theory and Practical Applications for Biomedical Signals bridges those gaps in a practical manner, showing how various aspects of system theory are put into practice by industry. The chapters are intentionally organized in groups of two chapters, with the first chapter describing a system theory technology, and the second chapter describing an industrial application of this technology. Each theory chapter contains a general overview of a system theory technology, which is intended as background material for the application chapter. 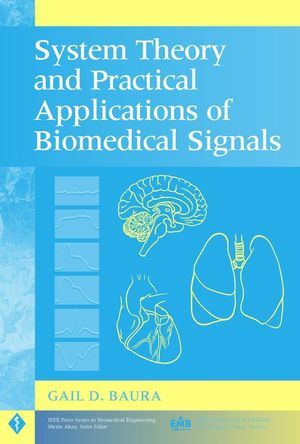 Each application chapter contains a history of a highlighted medical instrument, summary of appropriate physiology, discussion of the problem of interest and previous empirical solutions, and review of a solution that utilizes the theory in the previous chapter. Biomedical and DSP academic researchers pursuing grants and industry funding will find its real-world approach extremely valuable. Its in-depth discussion of the theoretical issues will clarify for medical instrumentation managers how system theory can compensate for less-than-ideal sensors. With application MATLABÂ® exercises and suggestions for system theory course work included, the text also fills the need for detailed information for students or practicing engineers interested in instrument design. GAIL D. BAURA received a BSEE from Loyola Marymount University in 1984 and an MSEE and MSBME from Drexel University in 1987. She received a PhD in Bioengineering from the University of Washington in 1993. Between these degrees, Dr. Baura worked as a loop transmission systems engineer at AT&T Bell Laboratories. Since graduation, she has served in a variety of research positions at IVAC Corporation, Cardiotronics Systems, Alaris Medical Systems, and VitalWave Corporation. Dr. Baura is currently Vice President of Research at CardioDynamics. Her research interests are the application of system theory to patient monitoring and insulin metabolism. 1 System Theory and Frequency-Selective Filters. 2 Low Flow Rate Occlusion Detection Using Resistance Monitoring. 5 Time-Frequency and Time-Scale Analysis. II MODELS FOR REAL TIME PROCESSING. 8 External Defibrillation Waveform Optimization. 10 Improved Screening for Cervical Cancer. 12 Continuous Noninvasive Blood Pressure Monitoring: Proof of Concept. 13 The Linear Compartmental Model. 14 Pharmacologic Stress Testing Using Closed-Loop Drug Delivery. 15 The Nonlinear Compartmental Model. 16 The Role of Nonlinear Compartmental Models in Development of Antiobesity Drugs. 18 The Need for More System Theory in Low-Cost Medical Applications.